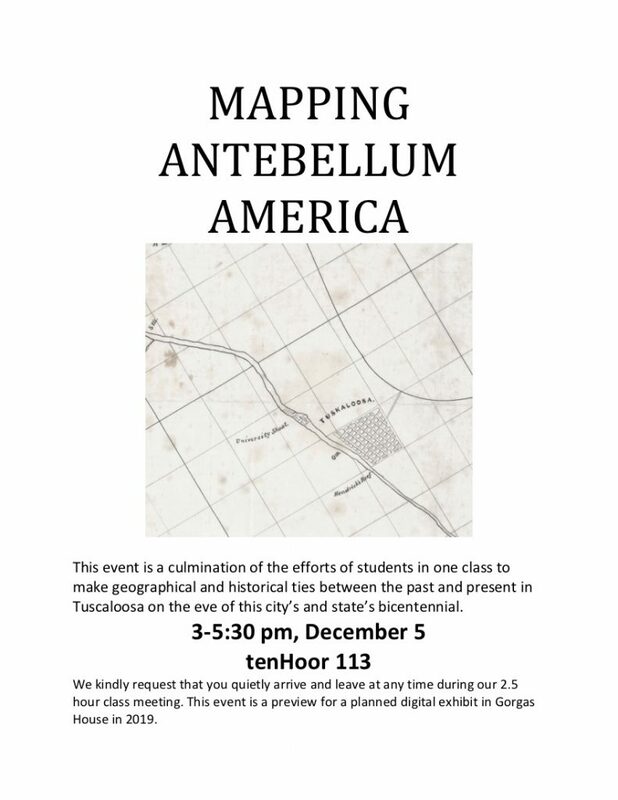 Students enrolled in Dr. Sharony Green‘s Antebellum America course worked with UA’s Cartographic Research Lab and visited several historical sites this fall, using the antebellum period as a starting point for “mapping” historical events and issues in Tuscaloosa and throughout Alabama in honor of Alabama’s 2019 bicentennial celebration. The results of their work will be on display from 3-5:30 PM, December 5, in 113 ten Hoor. Students will give 5-10 presentations during their regular 2.5 hour class time as a preview for a Spring or Fall 2019 digital exhibit being planned at the Gorgas House Museum, with Dolen Perkins-Valdez, author of Wench, a New York Times bestseller, and an upcoming novel set in Alabama, as a guest speaker. Visitors are welcomed to quietly enter and exit 113 ten Hoor any time between 3-5:30 PM, on December 5, to see the students’ preview presentations.